In the 1920s, chickens were not only pricey, they were also only seasonally available and not necessarily very tasty, either. Bred almost exclusively for their eggs, chickens were usually slaughtered in the fall when their egg-laying career was over. An extra zero mistakenly added to a hatchling chicken order placed by farmer Cecile Steele of Ocean View, Delaware, in 1923, followed by a nationwide contest to breed "The Chicken of Tomorrow" in 1948 changed all that. The deal was sealed with the introduction of the McNugget in 1980, and, today, Americans eat more than four times as much chicken as we did at the start of the twentieth century. But meatier, faster-growing chickens, industrial-scale farming methods, and innovative formats are only part of the story behind chicken's growing popularity. The rise of big chicken was fueled in large part by big pharma: specifically, antibiotics. In 1948, a British scientist, Thomas Jukes, was experimenting with adding vitamins and other supplements to poultry feed. Jukes worked for a company that also synthesized antibiotics, a new genre of wonder drugs that had just begun to transform human health, and so he decided to add a tiny amount of his company's antibiotic to the feed of one of the groups of chickens in his studies. His results were astonishing: the chickens on drugs grew 2.5 times faster than the hens kept on a standard diet. News spread fast, and only a few years later, American farmers were feeding their animals nearly half a million pounds of antibiotics a year. Today, between 70 and 80 percent of all the antibiotics used in the U.S. are given to animals rather than humans. Often, livestock are kept on low doses of antibiotics for their entire lives, in order to promote growth and prevent disease, rather than fight a one-off infection. As Maryn McKenna explains, antibiotics have transformed the chicken industry, but at an enormous cost: antibiotic resistance, or the ability of disease-causing bacteria to develop defenses against the drugs we rely on to cure illnesses and infections. The United Nations has singled out antibiotic resistance as a global crisis: they describe it as "a fundamental threat to human health, development, and security." Maryn McKenna is a journalist and author whose work focuses on public health and food policy. Her previous books include Superbug: The Fatal Menace of MRSA, and Beating Back the Devil: On the Front Lines with the Disease Detectives of the Epidemic Intelligence Service. Her new book, Big Chicken: The Incredible Story of How Antibiotics Created Modern Agriculture and Changed the Way the World Eat is published in the United States in September 2017, and in the United Kingdom in February 2018. Check it out! We sampled audio from this fabulous 1948 documentary about The Chicken of Tomorrow contest, digitized from the Prelinger Archives. One of the gems Maryn McKenna came across in her research is the process known as "acronization." 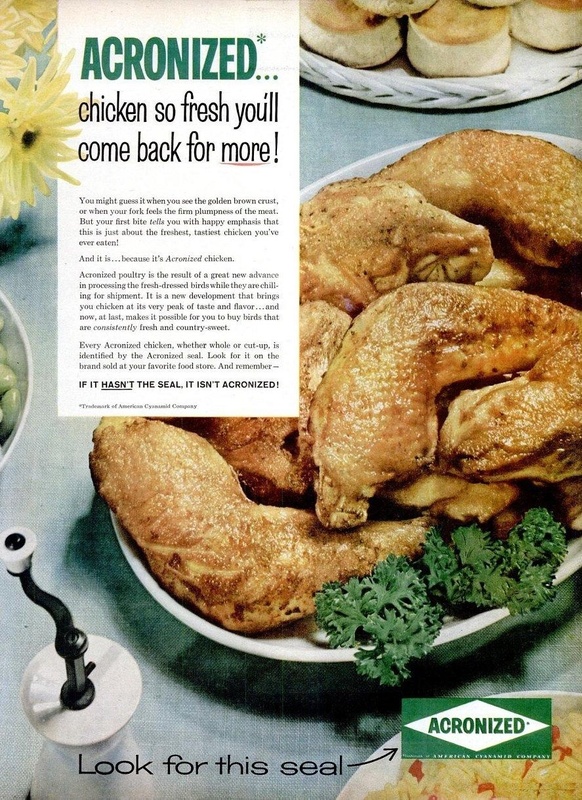 Here's an advert for acronized chicken from 1956. Notice the lack of mention of antibiotics... Yum!